An interesting fact about Burl Al Arab is its the third tallest hotel in the world and is located in Dubai, United Arab Emirate. It is 1,053 feet tall. 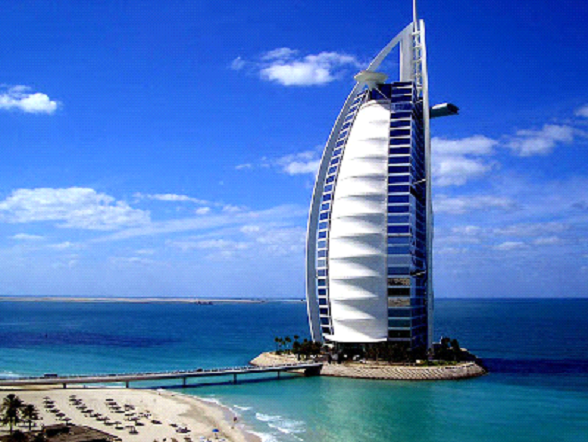 The Burl Al Arab has 56 floors, three of which are below ground. The hotel has 202 exquisite suites. 39% of the building is non-occupiable space above the 56th floor. The suites say luxury in every way, and they vary in size but are double storied. There are 142 one-bedroom deluxe suites. There are 28 two-bedroom suites. 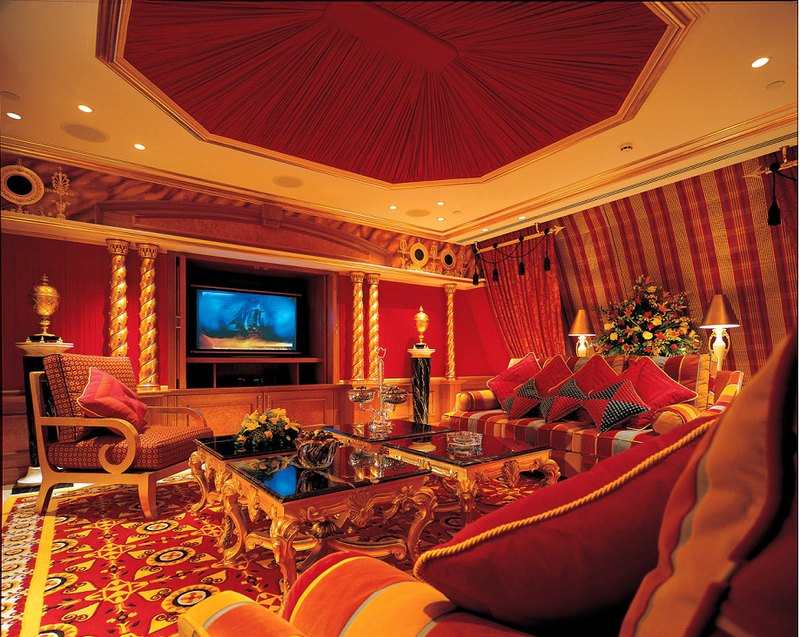 The Burl Al Arab has 18 Panoramic suites and 4 Club suites. They have 6 Diplomatic suites and two Presidential suites and two Royal Suites. The suites range in cost from $1000 to $24,000 per night. There are eighteen elevators in the hotel. The smallest suite has 1820 square feet of space which are larger than most people’s homes. The largest has 8400 square feet of luxurious space to enjoy while staying there which is larger than a lot of businesses. 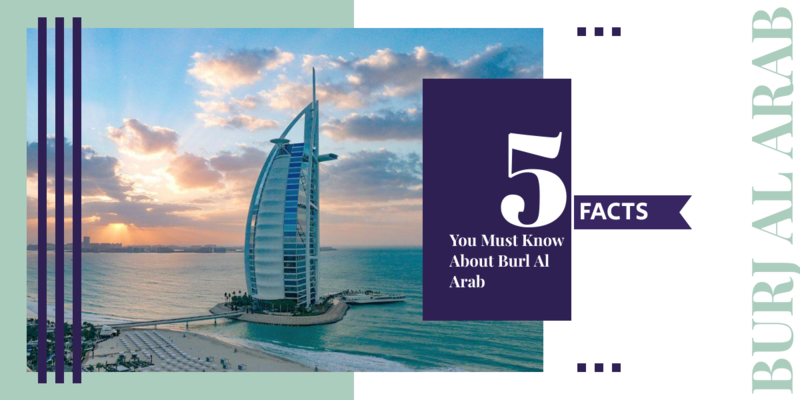 The second surprising fact about the Burl Al Arab is that it resides on a human-made island. The island is anchored about 920 feet from Jumeirah Beach which is one of the most popular tourist sites in Dubai. There is a private curving bridge that connects the island to the mainland. The island had to be secured before they could begin the work on the hotel’s foundation. They used 230 piles that were 130 ft to anchor it in the sand for the foundation. Then to finish the foundation they brought in a layer of rocks that they used a honey-comb pattern to cover in cement for the foundation to help prevent any erosion. The building contains 92,000 cubic yards of steel and more than 2,472,026 cubic ft of concrete in the construction of the hotel. The work to anchor the island in place took three long years to complete before construction could begin on the building itself. The architectural structure is designed in the shape of a sail and was designed specially to avoid shadowing the beach by Atkins and led by American architect Tom Wright of W. S. Atkins. The genius of this ground-breaking structure was intended to become the icon for Dubai. Construction began in 1994 and took 3000 different companies and 250 designers from Dubai, the UK, and the USA. The project took more than three years to complete the construction of the magnificent hotel with over 3500 workers at the cost of over 1 billion dollars. The hotel officially opened the 1st of December in 1999. To form the hotel, there is a steel skeleton that was enclosed with concrete. The mast is made of two wings that form a mast. They covered with a Teflon-coated woven glass fiber screen which helps protect the building from heat and dirt while still allowing light to penetrate during the day. At night the fabric has multiple colors of lights that illuminate it. The interior of the hotel is made of only the best materials in the world. You will find custom made carpets and rugs imported from South Africa and India. There is marble from Brazil and Italy. The wooden doors are from Dubai itself. The gorgeous chandeliers were imported from the UK. They have mosaic tile in the bathrooms. There are white columns throughout the building that give it a feeling of grandeur. Perhaps nothing can compare to the 24-carat gold leaf that has been used to embellish the interior of the hotel. The gold leaf covers an incredible 19,270 square feet making it attractive to some of wealthiest people in the world. Not only will you find gold used in the interior of the Burl Al Arab hotel, but you will also find 29,000 Swarovski crystals that are located in the ceiling of the Junsu Lounge. The crystals have been hung to represent the shape of the Milky Way which is a fantastic feat! Another interesting fact about the Burl Al Arab is that it has a helipad near the roof at about 689 ft above the ground. The helipad was designed by Irish architect Rebecca Gemon. Over the years this helipad has been the critical location of several events such as Tiger Woods teeing off it in 2004. In 2005, Andie Agassi and Roger Federer played tennis here. Another couple of things that the helipad has been involved in is the filming of Ronan Keating’s music video, and the shooting of The Todays Show in 2006 called “Where in the world is Matt Lauer?” Rory Mcllroy preformed a bumper shot from the helipad in 2011. In 2013, David Coulthard drove a Formula 1 racecar on the helipad while doing donuts. Nick Jacobson in 2017, kiteboarded down to the sea. You may have read about the helipad at Burl Al Arab or seen it in movies and television shows such as Mission Impossible, Syriana, and others. 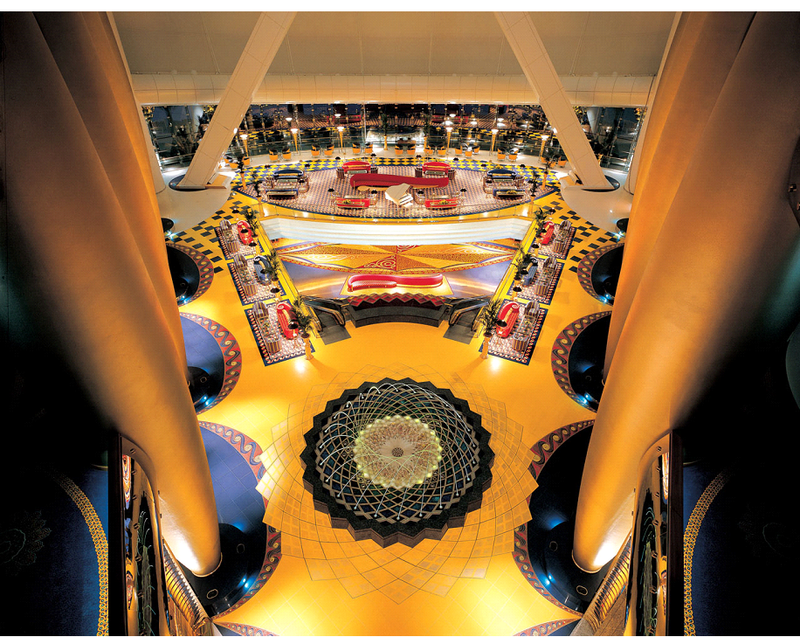 Another interesting fact about Burl Al Arab hotel is the two restaurants within the building. The first one is called Al Muntaha is located 660 feet in the tower and is by a cantilever that goes 89 feet from either side of the mast. Patrons access it from a panoramic elevator. The view of Dubai is impressive from the Al Muntaha. The second restaurant is the Al Mahara which to get to you must go through a simulated submarine voyage which features a sizeable seawater aquarium. The aquarium contains 260,000 gallons of water. The tank is made of acrylic glass to help withstand the water pressure. It has a thickness of a little over seven inches thick. Several other restaurants are within the walls of the hotel, but they do not meet the splendor of the Al Muntaha and the Al Mahara but still worth checking out. 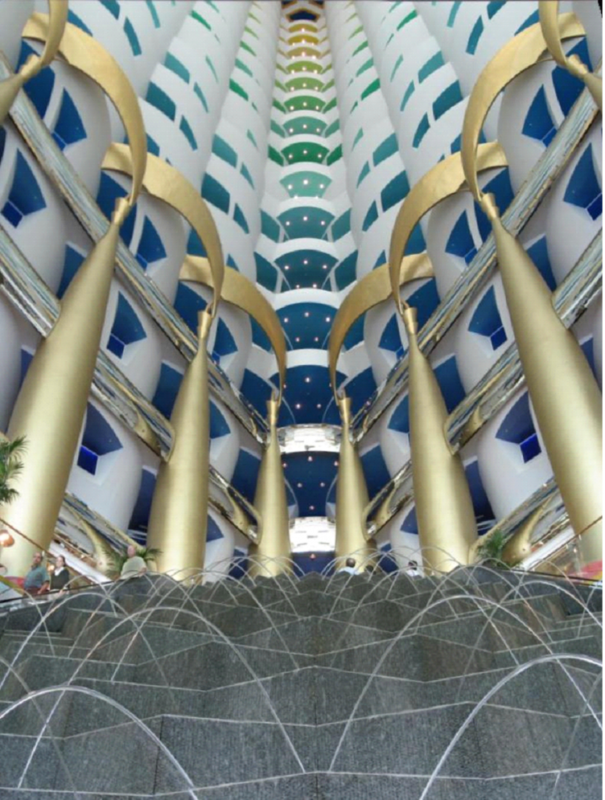 The fifth fantastic fact about the Burl Al Arab is that it has a massive atrium and a Cascade waterfall. The atrium is the world’s tallest atrium in the world. It is 600 feet tall. The atrium lets in a supply of abundant warm natural light. There is a beautiful fountain that shoots water up in sudden bursts to over 42 meters in the air and does a little dance of water arches. The Cascade Waterfall combines the use of atomized water with fiber optics which makes it look like a kaleidoscope. The choreographed movement is beautifully orchestrated from the glass and stone-filled steps which cause the water to arch in an elegant gesture. These two additions to the hotel are both beautiful and something you will not want to miss on your trip to Dubai. 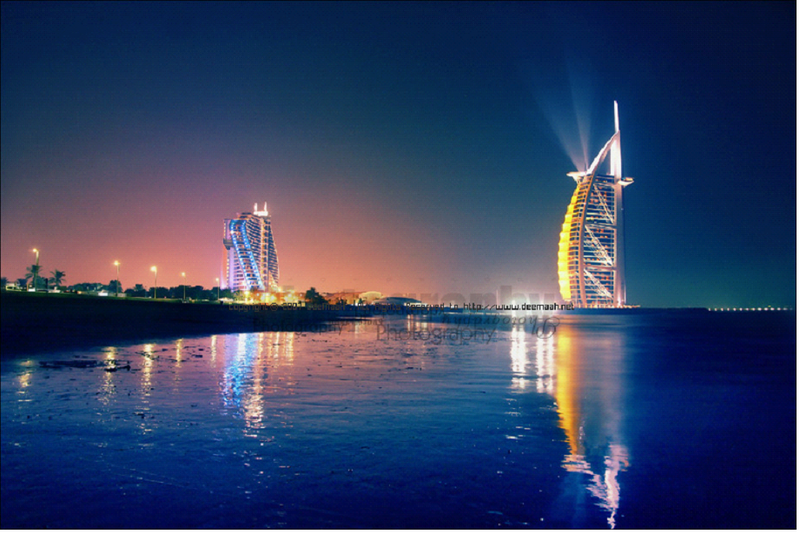 The Burl Al Arab is one of the most exquisite hotels in the world and is well worth the visit. Even if you can’t afford to stay there overnight, you will want to see the beauty for yourself. The splendor is unsurpassed in all of Dubai and no trip to Dubai would be complete without the grand tour of the Burl Al Arab.